The innovation process in pharmaceutical research is continuously evolving. In the past, companies used to work in a closed model where new ideas and knowledge came mainly within house. This model is no longer sustainable and the pharmaceutical industry is increasingly opening up the innovation model. 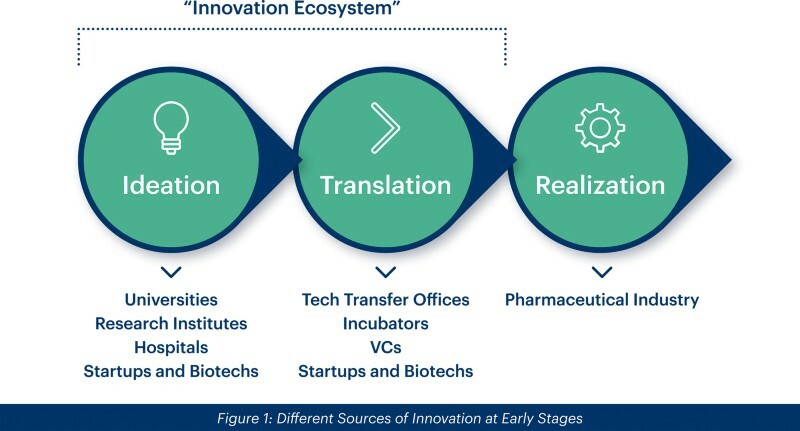 Nowadays, collaborating with all stakeholders involved in the research process, such as academia, biotechnology firms, other pharmaceutical companies and funding bodies, is essential for a successful business and to transform innovative ideas into valuable solutions for patients1,2. At Almirall, a global pharmaceutical company focused in medical dermatology, we firmly believe in partnerships to share knowledge, science and efforts, and to build synergies that accelerate the R&D process. Therefore, as part of our strategy to find treatments that are tailored and differentiated from the current standard of care, we are implementing external innovation initiatives to identify therapies, technologies and devices that address unmet medical needs in dermatology. Different types of collaborations implemented at Almirall include public-private partnerships, private-private partnerships, funded projects, and crowdsourcing initiatives (Fig. 1). Recent examples of research partnerships in dermatology are illustrated below. In 2017, Almirall and LEO Pharma joined forces to establish a public-private partnership to advance the understanding and treatment of skin diseases by setting a new standard for skin sampling. The aim of the project is to develop and clinically validate a painless, minimally invasive skin sampling method that enables accurate and comprehensive biomarker analysis in clinical trials and exploratory research. The research is being conducted at the Hospital Clinic of Barcelona (Spain), the Technical University of Denmark and the University of Bath (UK). The methodology will be validated in selected patient populations. Final research results will be published in peer reviewed journals. The research collaboration between Almirall and Mercachem focused on the development of oral cytokine blockers for the treatment of inflammatory skin diseases. Within this project, which started in 2017, Mercachem is performing iterative optimization campaigns towards the identification of oral cytokine blockers for Almirall to further develop them. The cytokine blockers programme has its origin in the collaboration of Mercachem with Vipergen using its unique DNA-encoded library and Binder Trap Enrichment® (BTE) assay technology (www.vipergen.com). This breakthrough technology allows the identification of small molecules that can block protein-protein interactions. It opens up a whole new category of drug targets of great interest in dermatology. Very recently, Almirall and Evotec have announced a research collaboration to discover and develop first-in-class therapeutics through a novel approach to disrupt cell signalling that is expected to deliver highly potent and durable treatments for debilitating dermatology diseases such as psoriasis and atopic dermatitis. A key factor to successfully access external innovation is to reach the wider scientific crowd. With this in mind, Almirall launched AlmirallShare (sharedinnovation.almirall.com) a web open innovation platform created to facilitate collaborative projects with scientists world-wide and find innovative solutions to address unmet needs in skin health. AlmirallShare addresses different dermatological challenges in a flexible and customized manner. It offers several collaboration opportunities including the development of translational research models for understanding the pathology of skin diseases, the identification of novel targets for dermatological disorders, and the identification of new uses in dermatology for existing advanced compounds. Additionally, it may offer funding opportunities and mentorship for collaborators. Scientists from universities, research centers, hospitals, start-ups, biotechnology firms, and pharmaceutical companies all over the world with an interest in dermatological research are invited to participate. All submitted proposals are evaluated through a transparent and open process. The proposals selected are driven forward in collaboration with scientists at Almirall that result in innovative actionable projects. In summary, accessing disruptive technologies and developing new treatment paradigms is key to the sustainability of R&D. Harnessing innovation at different stages of development with different partnership models will provide better outcomes for patients. Schweizer, L. & He, J. Drug Discov. Today 23, 213˛218 (2018). Holmes, D. Nature Outlook: Open Innovation 533, S54˛S55 (2016).